You may have seen reports this week of a volcanic eruption on the Big Island of Hawaii. Impressive, and slightly unnerving, footage shows lava suddenly erupting through streets and gardens, engulfing homes and forcing the evacuation of thousands of residents. But how did this happen? Why did the eruption at the reliably active Pu’u O’o crater suddenly stop? And why did lava spring up in the middle of suburbia instead? The answers to these questions, as well as a brief explanation of the possible causes of these events, are detailed below. But first, a little introduction to the geology of Hawaii. The Hawaiian Islands are the exposed peaks of a giant sub-marine mountain range called the Hawaii-Emperor Seamount Chain. This enormous feature can be traced as a series of islands, islets, atolls and seamounts that stretches over 5,800km across the Pacific Ocean from the Big Island of Hawaii all the way to Russia. A mantle plume beneath Hawaii brings hot, less dense and less viscous magma from deep within the Earth. This pools beneath the crust to form the so-called Hawaiian Hotspot. Because this material is hotter and less dense than the surrounding mantle and overlying oceanic crust, it is more buoyant and breaks through the crust to erupt onto the sea floor. There it solidifies to form new rock, which has slowly built up over hundreds of thousands of years producing a summit that has risen out of the sea and given birth to an island. Hawaii actually comprises five individual volcanoes. In order of oldest to youngest they are: Kohala, Mauna Kea, Hualalai, Mauna Loa and Kilauea. Kilauea is the most active, and most studied volcano on Earth. It has been erupting almost continuously since the first written observations in 1820. The most recent phase of volcanic activity started in 1983 in the East Rift Zone and is ongoing today, making it the longest-observed eruption anywhere on the planet. At the end of April this year, all monitoring stations on Kilauea were reading normal levels of activity. For many months the Halema'uma'u lava lake had been rising and falling predictably, and the caldera itself inflating and deflating in a consistent pattern. On the morning of the 30th April something happened. The level of the lava lake started to drop and the caldera to deflate, following Kilauea’s regular cycle. The area around the Pu’u O’o vent in the East Rift Zone was showing increased levels of seismicity and ground deformation. At around 2pm, the Pu’u O’o caldera collapsed in on itself, creating a reddish, dust-rich plume which rose, ominously, above the vent. 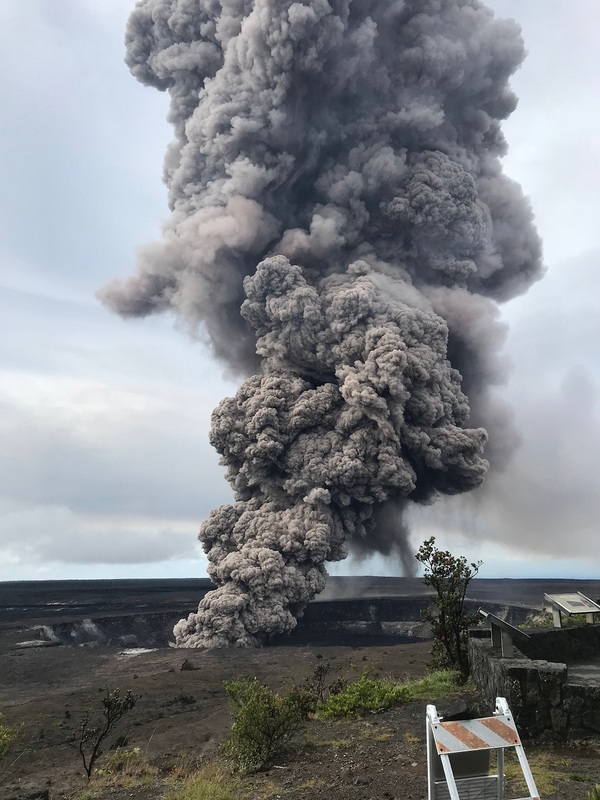 Throughout the day there were repeated rock falls into the vent, but poor weather prevented Hawaii Volcano Observatory scientists from being able to view the caldera and assess the situation. On May 1st the weather cleared and geologists were able to see for the first time the extent of the caldera collapse. They discovered a large, 1km long crack on the side of Pu’u O’o that was venting steam. There was also evidence of some recent lava splatter, but no lava flows. On May 2nd small cracks started to appear in roads in the Leilani Estates subdivision, a housing estate 20km northeast of Pu’u O’o and straddling the East Rift Zone. An increasing number of small magnitude earthquakes continued to rock the southern flank of Kilauea and the East Rift Zone in particular. 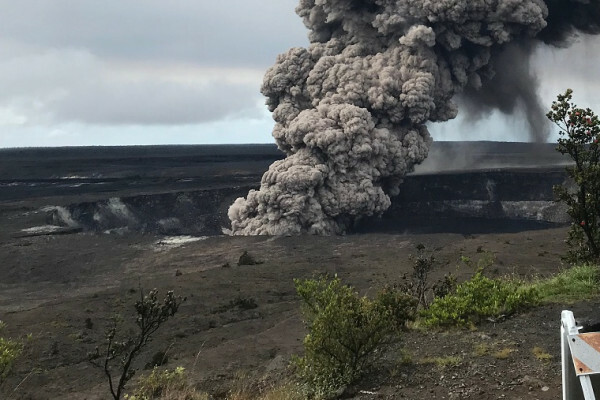 A magnitude 5.0 earthquake on May 3rd resulted in a total collapse of the Pu’u O’o cone, generating another big dust plume and shutting off lava flow from the vent. More cracks started to appear and grow in Leilani Estates, with heat and vapours now being emitted. The first lava splatter was confirmed around 5pm and continued for around an hour and a half before stopping. The earthquakes continued to rumble and several new cracks appeared. Overnight, Fissures 2 and 3 erupted, producing lava splatter up to 30m high and emitting high levels of sulphur dioxide. New fissures formed regularly, each repeating the same pattern of initially passive crack formation, followed by the steam and heat emissions and subsequent short period of lava splatter before becoming inactive. On 7th May a large, magnitude 6.9 earthquake marked a change in activity at both Leilani Estates and Halema'uma'u. Fissure 8 in Leilani Estates produced a lively lava fountain that reached 100m in height and an a’a lava flow (a slow moving, blocky, viscous flow) that extended 900m from the vent. Meanwhile, the level of the lava lake at Halema'uma'u had dropped and was now 220m below the crater rim. 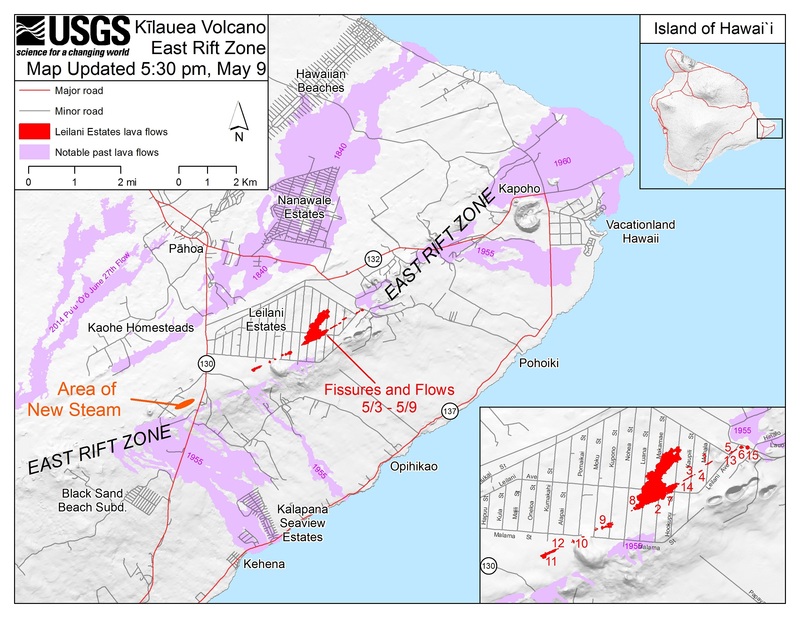 Fissures 1 to 8 formed a line orientated northeast and aligned within the East Rift Zone. New fissures appeared along this line within Leilani estates and cracks started to appear along Highway 130. The deflation of the Kilauea caldera and receding of the lava lake continued. At the time of writing, the lake level was 295m below the floor of Halema'uma'u crater and 15 fissures within Leilani Estates had been confirmed, although all had ceased erupting. Cracks along Highway 130 continue to vent steam but no lava was seen yet. So, what is going on inside Kilauea’s lava plumbing? All magma erupted on Kilauea is sourced from the same magma reservoir. The collapse of Pu’u O’o crater floor marked the first signs of magma draining from the area. At this time Halema'uma'u continued to inflate and deflate in its regular pattern. The increase in seismicity in the following days illustrates the response of the ground to a new injection of magma into the East Rift Zone. The magnitude 5.0 earthquake caused a big collapse of the Pu’u O’o cone that effectively plugged the vent, ending the existing lava flow and forcing the magma to find another route to surface. Activity at the Halema'uma'u lava lake saw a dramatic change following the magnitude 6.9 earthquake on the 4th May. Although the lake was already slowly dropping, the rate of drop increased after the earthquake and has remained at a steady 2.2 metres per hour since. One possible explanation is that the movement of the ground during the earthquake created accommodation space within the mountain within which to store magma. What is clear is that the volume of magma lost from Halema'uma'u exceeds that extruded in Leilani Estates. If magma sourced from the Summit Reservoir System continues at the same rate, we can assume the drop in the lake is because lava is travelling to other parts of the subsurface faster than the source can replenish it. The HVO have many sensors monitoring the entire volcano, including tiltmetres, seismographs, GPS, gas detectors and live video feeds. Analysis of these data show the ground is responding to changes in the location of subsurface magma storage. Continued seismicity in the East Rift Zone and uplift in the area suggest that magma is being intruded and stored along the rift. Will the eruption continue or increase in intensity? It is unlikely that we have seen the end of volcanic eruptions in the East Rift Zone. If the Summit Reservoir System is still supplying magma to the volcano (and we have no evidence to suggest any change there) then it is likely eruptions will continue. If the Pu’u O’o vent is indeed blocked, the East Rift Zone may offer the path of least resistance for future eruptions. The last reported surface cracking was located along highway 130, in line with the existing fissures. These cracks were venting steam and gases. Following the pattern the previous fissures displayed, a logical prediction would suggest these be the site of the next lava eruption. Having said that, we are unable to see deformation and cracking in the forests surrounding Leilani Estate and the highway so additional cracks may be concealed. What about Kilauea’s big sister volcano Mauna Loa? Interestingly, although Kilauea and Mauna Loa sit side by side, and are both considered active, they have separate and geochemically-distinct magma systems. Activity on the two volcanoes is not connected. There have been times in the past that eruptions on the two volcanoes appeared to be interacting, but it is likely that this is due to changing pressure regimes at depth, opening and closing lava conduits in response to eruptions, rather than both participating in the same eruption, per se. Is there a risk of explosive eruptions? · Effusive – where hot, runny magma erupts steadily out onto the ground. · Explosive – violent eruptions where lava and rock fragments are violently expelled from the vent. This type form large volcanic ash plumes and pyroclastic flows. Although most activity in Kilauea in the last 200 years has been effusive, it is capable of explosive eruptions. The type of eruption is governed by the chemical composition and temperature of the magma. The magma in Kilauea is a type called Tholeiitic Basalt. It forms from direct melting of the underlying mantle, contains few dissolved ‘volatiles’, has low silica content and has low viscosity. Because it is less viscous, gases escape more easily and the magma has a diminished capability to form explosive eruptions. In the past, however, Kilauea has produced phreatic explosive eruptions. This occurs when water within the ground interacts with magma, as well as the hot exposed walls of the vents. This causes the water to flash boil, producing vast quantities of steam. The steam expands extremely rapidly within the pore space of the rock, blasting it apart. Phreatic eruptions on Kilauea in 1923 produced ash columns high enough to reach the jet stream. Ash was deposited as far away as Hilo, 40km to the north, and chunks of rock weighing several tonnes were thrown hundreds of kilometres from the vent. The column of magma in the Halema'uma'u lava lake produces a hydrostatic pressure greater than that of the ground water in the surrounding rock, preventing water flowing towards the vent. If the level of the lava lake falls below that of the water table, ground water may start to seep towards the vent and, upon coming into contact with the hot walls of the conduit, flash to steam and cause phreatic explosions. If the present trend continues, the level in the lava lake will fall below the water table (600m below the crater surface) sometime in mid May. Over tens of thousands of years, and with successive eruptions, Kilauea has grown. Much like building a sandcastle, there is only so much sand you can pile up before the castle becomes unstable and collapses. The same thing happens with all mountain chains. As the mountain grows, the weight of the mountains creates a downward force which exceeds the strength of the underlying rock, leading to extensional faulting. On Kilauea, as new material continues to be extruded onto the summit, the volcano cannot support its own weight. The Southwestern Rift Zone and East Rift Zone mark the surface expression of sets of growth faults that facilitate the seaward movement of the entire east flank of Kilauea at a rate of 6-10cm per year. Studies have suggested that these rift zones provide conduits for transport and storage area for magma within the volcano. Of the 61 separate volcanic events since 1923, just over half been at the summit caldera, 24 in the Eastern Rift Zone and 5 in the relatively quiet Southwestern Rift Zone. Why choose to live on the rift zone?